Gold, set in 1948, tells the historic story of the hockey team that won the first Olympic medal for India as a free nation on the 12th of August 1948. The same date this year commemorates the 70th anniversary of this historic feat. The story of Gold highlights India's emergence from the shadow of the British Empire as it meets the British hockey team on the field, this time as a nation in its own right. 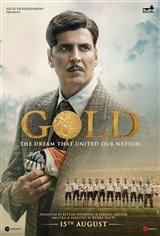 Gold is an inspirational story of a team that fought against all odds to bring their nation hope, pride and respect.